The Greenpoint IT team has the skills and spare parts to fix any problems with your Bose SoundDock. If you own one of these specialist speakers for your iPod or iPhone, it’s probably a piece of equipment you don’t want to part with; but thanks to Greenpoint IT, you don’t have to. We can repair your Bose SoundDock and get it back to you in no time at all. Here at Greenpoint IT, in Barry, we have Bose SoundDock experts who can get your music pumping again with the help of their unique technical skill set, precision tools and a huge selection of high quality spare parts. 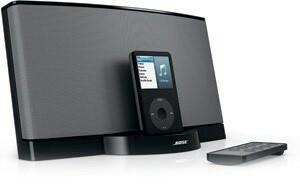 Common problems with your Bose gadget can include the SoundDock not charging or a broken connector where your iPod or iPhone should fit. We can easily replace these connections and other parts on your Bose SoundDock. This repair will also upgrade your gadget, allowing you to charge newer iPhone or iPods without having to remove them from your Bose SoundDock. The Bose SoundDock repairs we carry out include battery, charging port and headphone jack replacement repair, sound quality problems and much more. We have lots of experience fixing all of these problems and can get the job done without delay. Don’t think your Bose SoundDock is destined for the scrapheap, there are many internal and external problems that our qualified engineers can fix. The first thing we do is assess the problem and in the unlikely event that it can’t be fixed, you’ll pay nothing for our time, thanks to our fair no fix, no fee policy. Our welcoming team are based at our repairs workshop in Barry, where customers are invited to visit during working hours. We can also arrange to collect your broken Bose SoundDock from your home or office in the Cardiff, Barry, Newport and South Wales region. We’ll fix it and return it to you, all at a very affordable price. You’ll also get a price estimate for the repairs in advance so you know what to expect. We offer a national service, with courier collection costing £15, return delivery £10. If you need a box sent out let us know. Customer service is very important to us and we always strive for 100% customer satisfaction. If you need your Bose SoundDock urgently, just let us know and we’ll do our best to make it a priority. Greenpoint IT also stocks a massive range of spare parts and accessories for all your gadgets, so why not drop in for a browse or call us to order what you need. Do you want us to pick it up?